It's no secret that I am not a pink gal. 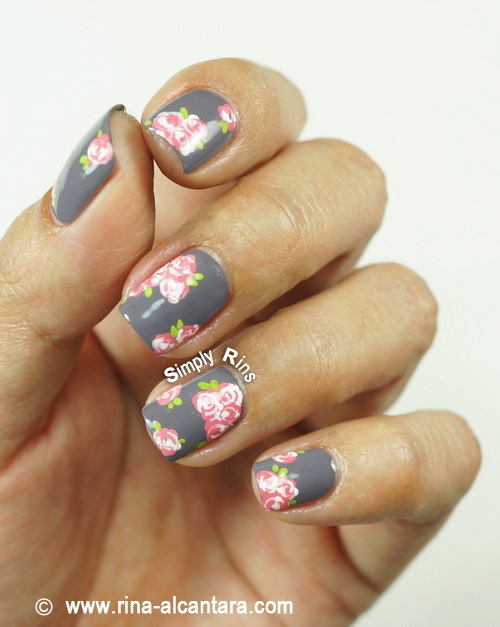 But I've always wanted to create a nail art with the gray and pink combo. And I think I found a good excuse since it's Valentine's season! I decided to paint pink roses with a vintage feel. I have done something similar a few months back that I called Bunch of Flowers. Usually, I don't really post nail art that I have previously done. But I'm starting to think that I should because I think different color palettes will yield different results to the same nail design. Do you think so, too? One thing I really like about painting roses like this is that strokes don't really need to be perfect. Random squiggles does the trick! I used 2 coats of Dazzle Dry Anticipation as the gray background. Perhaps you'd prefer a darker shade of gray so that the pink roses would really pop. As for me, I decided to use a medium gray as base to achieve a more dainty feel. I hand painted this nail design using acrylic paints and a detailing nail art brush. Initially, I wanted to paint the roses with different shades of pink. But because the laziness kicked in, I contented myself with one shade. I think this would look more beautiful with different pink hues. 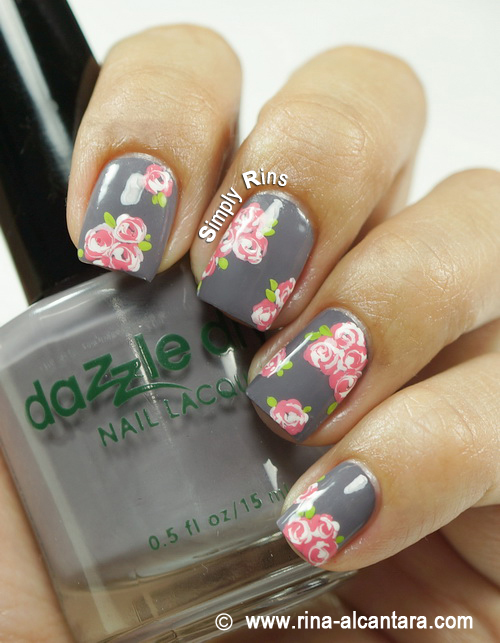 If you're looking for a Valentine's nail art idea is subtle and classy, I would definitely recommend the vintage rose design. Go ahead and customize it with your preferred colors to make it more personal. I think this Valentine's nail art design would look stunning when you go out to celebrate love. It's feminine and timeless. Have you tried creating a vintage rose nail design? What colors did you use? I always think roses are classic. 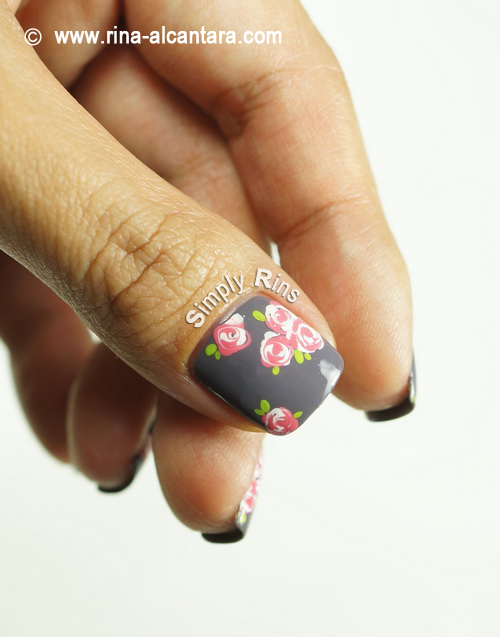 It would always look amazing on nails. Your roses are so perfect! Will you be posting a tutorial for them? I can never get my roses to look like these! Gorgeous nails! The roses are wonderful and the colors look so good together! Wow, these roses look so real. It's lovely! Beautiful! I did a design with a grey background and pink roses a while back, but I love how you clustered the roses together, it looks so beautiful!! I wanna try a design like this too! :D Very feminine! I like the idea and the combination of colors! Only, the shade of gray doesn't really go quite well as the base. Gray is fine, but not that kind of gray. **For me! That is. Lighter, perhaps? I've been browsing pages of your nail art and I think they all look amazing, but this totally blew me away! Amazing! I'm not a big fan of nail polish. This design, however, made me wish my nails weren't as awful so I could wear it! Haha.